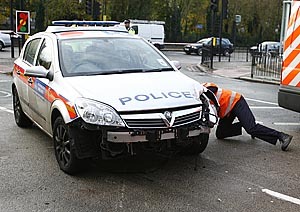 On the way to a job this morning I saw the aftermath of a police prang. Nothing spectacular unfortunately, or fortunately, depending upon your point of view. 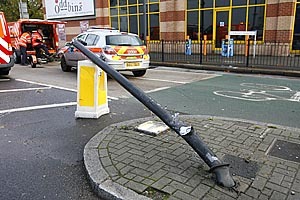 The old bill took out a traffic light standard, no doubt chasing someone who had committed a really serious offence such as parking on double yellow lines or smoking a cigarette whilst driving.